The Kansas City Royals finally win one in regulation, continuing their reign atop the Rational Pastime postseason projections for another day. As 41% favorites, Kansas City is joined by San Francisco, who improve to 35% after their road win against the St. Louis Cardinals in Game 1 of the NLCS. 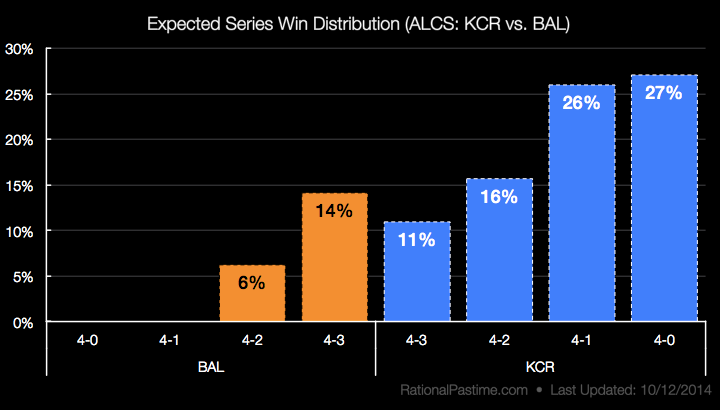 Down 0-2 in the ALCS heading to Kansas City, Baltimore is facing their worst odds of the postseason at 8-1. St. Louis is only a percentage point better, having dropped their first game at home. By owning the O's in Baltimore, a Royals sweep is now the most likely outcome in the ALCS, followed by a Kansas City win in five. The Orioles best shot is to force the series to seven games. 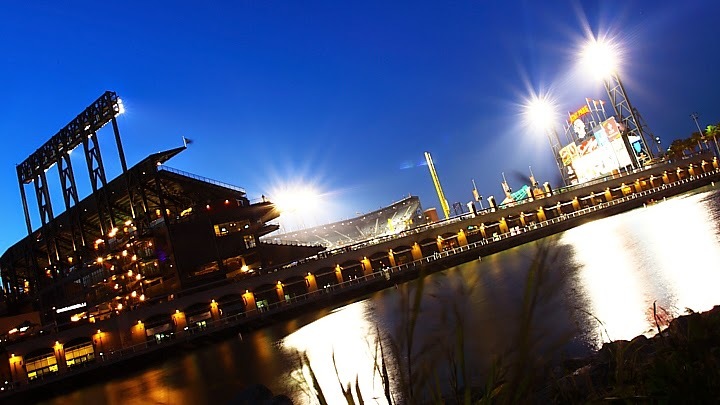 Meanwhile, San Francisco is sitting pretty—the modal outcome being a Giants win in five. 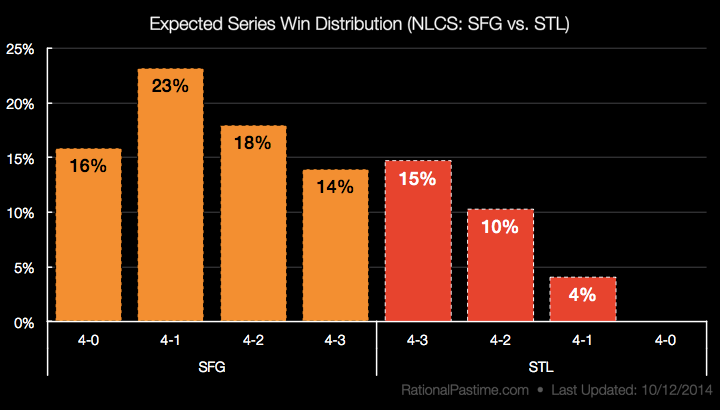 Like Baltimore, St. Louis' best shot is to force a Game 7, in which they'd be only marginally favored over San Francisco. 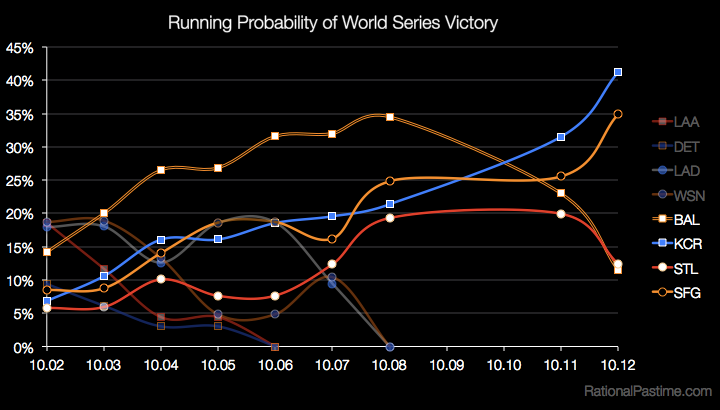 A KC win over San Fran at home is the most likely World Series outcome given what we know at the moment. San Francisco has pushed its way up the list, however; a win at home against Kansas City is the 3rd through 5th most likely Fall Classic Result. The chances of a Show Me State Series currently hover around 23%, while a 1966 World Series rematch is now only a 6% possibility. 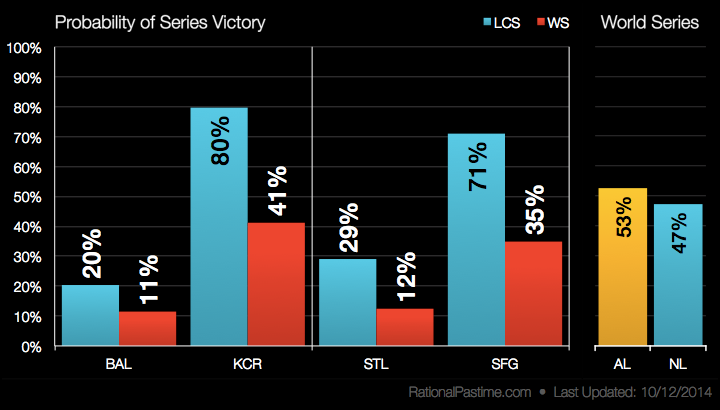 Stop by tomorrow for updated ratings, probabilities and charts following today's NLCS action.